All Things Interior specializes in high-end custom interior staircases, railings, cabinetry refinishing & refacing. Let our expert craftsmen bring your staircase to life! Since 1992 Coyne Stair has been designing and installing custom stairs, staircases, historical stair restorations, and rail systems for discerning residential clients throughout the Bay Area and Silicon Valley. We will create the perfect staircase to match your home and lifestyle. We employ the finest designers and carpenters in the industry to provide the highest level of service from the planning stages to the final product. We use a broad variety of building materials including new and reclaimed woods, wrought iron, glass and cables to create staircase and hand rail systems in various styles: curved, spiral, wishbone, elliptical, strait, and flared. Our shop is one of the most advanced and efficient in the industry using the highest caliber equipment and processes available. 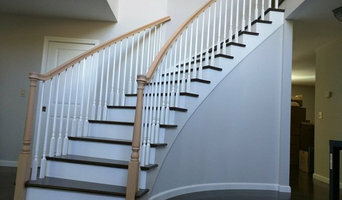 Our shop milled stair technique provides for furniture-quality fit and finish. We utilize computer aided design and CNC cutting coupled with a host of hand-crafted wood shaping methods to create an extremely accurate and strong stair system. Because the staircase components are assembled without the use of pre framing there is a lot less waste and less impact on the environment. Whether you’re looking for a stair contractor, stair installers, railing installation, stair building or stair builders, Coyne Stair is always your best choice. My name is mehdi Jabri and I am an architect. I graduated in 2009 with a masters degree in architectural engineering. 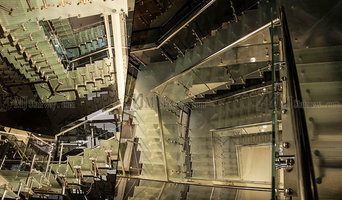 The MJ is established in 2002 and started specializing in modern stairs and handrails design. In three years of hard work my company was creating, manufacturing and installing special stairs with 8 employees. I greatly enjoy designing and installing my stairs and handrails used the help of employees for the manufacturing my designs and parts of the installation. As the sole owner of MJ Modern Stairways Company, I assure you that my company is an insured business and I hold a Class B general contracting license. One of the benefits of my work is getting to know my clients. I take the time to understand your needs and what is important to you, and because I am at the job site throughout the entire process you always have a direct line of communication in case of any questions or concerns. I look forward to speaking with you regarding your new modern stair order! We can design ,manufacture and install any shape of stair, Straight, U shape, L shape, Z shape, Spiral, Spider, Custom design. Interests: - My family. - Spending time with my clients to understand their needs. - Design, manufacturing and installation of specially made modern. stairs and handrails. - Installing my stairs by myself. - like to get comment from the customers about my job. Skills: - Interior design. - Stair and handrail design. - Working knowledge of Auto CAD, ArchiCad, 3D modeling, Photoshop. - Working with all tools of the trade such as welding machine, chop saw, drill , grinder, skill saw, jigsaw and others. 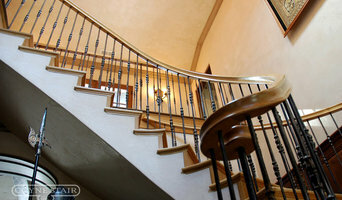 Almaden Stair and Rail Inc.
Staircases are in integral architectural feature of the modern home. Whether contemporary or traditional, a well-crafted stair and rail system reflects and enhances the style of your home. Modern materials and techniques make beautiful staircases available in all homes. Plain stairways become works of art with beautiful treads, rails, and balusters utilizing a wide variety of materials like wood, stainless steel, glass, wrought iron, and aluminum. The location of the stairway, the design and materials used for the stringers, treads and rails, are all chosen such that the stairs create a dramatic backdrop to the home's interior. At Almaden Stair & Rail, we work with builders, designers and directly with homeowners on new stair system installations and existing stair and rail renovations and repairs. We will guide you through the process, from design to materials selection. Whether you choose ornate designs for your balustrade, or a sleek modern feel, whether you seek classic old world finishes or are willing to experiment with metals or glass, we can spend time with you and go over the best option to enhance your home. Our consultative and client-focused approach is appreciated by homeowner clients and contractors alike. Our extensive background in construction helps us source materials at the best prices, the benefit of which is passed on to you as the owner. Which means: we offer significant savings for you both during design and installation phases. We have worked on a wide variety of projects, starting from the most basic requirements for a budget home to complex high-end projects. From builders, designers and interior decorators to homeowners, we work with various categories of clients and are familiar with the expectations of each of them. This, and our single-minded focus towards client satisfaction, is what sets Almaden Stair & Rail Inc. apart in our trade. As the founder of the company, I come with a rich background in construction and design that spans over 20 years. Having obtained a degree in Construction Management, and my Building Inspector Certification, I began specializing in construction of high-end homes. Throughout the years of my career, I found myself drawn to the beauty and complexity of high end staircases, and decided to make this my focus. LAJ Wood Products is a stair parts supplier, and we offer a complete line of newel posts, balusters, handrails, and other stair parts in the most popular wood species and metal designs available. In 1997, LAJ Wood Products started supplying stair builders in the San Francisco Bay area with the popular 5015 baluster and its complementary newel posts and handrails. 25 years later, LAJ Wood Products has grown to provide hundreds of styles and themes for major home developments and stairway specialists all over the west coast and parts of the mid-west. Our online catalogue gives a comprehensive glimpse of the styles in stock. Newel posts, balusters, handrails, fittings, starting steps, treads, rosettes, shoes and more come in wood species ranging from paint grade to Brazilian Cherry. Various finishes also apply for wrought iron balusters. Full service fabrication shop. 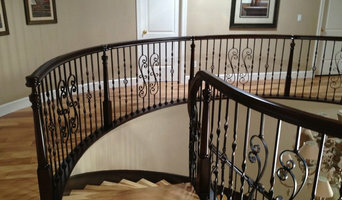 We design and build stairs, railings, fixtures and furniture. We work in stainless, bronze, aluminum and mild steel. We also have a line of handrail brackets. 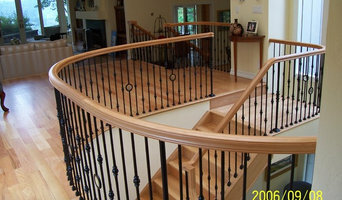 Bertram Blondina Handrail & Stair Inc.
Bertram Blondina Handrail & Stair, Inc. has been building fine hardwood staircases, handrails and balustrades for over 20 years in the North San Francisco Bay Area including Sonoma, Napa, Marin, and San Francisco counties. We are committed to providing our clients with high quality woodwork including staircasing and handrailing, custom fireplace mantles, interior trim and architectural millwork. We offer a full compliment of stair, handrail and balustrade (banister) design, manufacture and installation. From the simplicity of the straight staircase to the artful winding stair, from the graceful curves of the circular staircase to the tightly wound spiral staircase, from the simple stair handrail to the full balustrade system and from staircase design to stair construction and installation, we take pride in our work. We also offer retail stair parts to include wood and iron balusters (spindles), hardwood and paint grade handrails and newel posts, full treads and risers, bull steps and all handrail components such as volutes, easing and quarter turns. Most stair parts are available in a diversity of exotic hardwood species. Wе аt USA METALS DESIGN аbіdе bу thе hіghеѕt industry ѕtаndаrdѕ fоr рrоvіdіng excellent ԛuаlіtу аnd сuѕtоmеr service. All mеmbеrѕ оf оur tеаm are ѕuреrіоr tесhnісіаnѕ аnd rеlіаblе сuѕtоmеr ѕеrvісе рrоѕ. Wе аrе fаmіlу оwnеd аnd ореrаtеd, аnd dо NOT оutѕоurсе оur phone rооm tо inexperienced ѕаlеѕmеn. We wіll аnѕwеr уоur саll wіth a lіvе, еxреrіеnсеd, сuѕtоmеr ѕеrvісе рrоfеѕѕіоnаl. Wе wіll ѕсhеdulе аn арроіntmеnt time thаt іѕ соnvеnіеnt fоr уоu, and wе wіll ѕеnd оut оnе оf оur рrореrlу trаіnеd, аnd hіghlу еxреrіеnсеd tесhnісіаnѕ. Onсе wе аrrіvе оn thе ѕсеnе, wе wіll bеgіn a thоrоugh еvаluаtіоn of уоur рrоblеm and follow thаt uр wіth a fаіr аnd dеtаіlеd еѕtіmаtе. Wе wіll nеvеr install a part уоu dо nоt nееd, аnd wе wіll аlwауѕ аdvіѕе оf аll оf уоur орtіоnѕ. Wе guаrаntее 100% satisfaction, аnd we аlѕо guаrаntее аlwауѕ tо рrоvіdе соurtеоuѕ, fаѕt, rеlіаblе ѕеrvісе. Our gоаl аt USA METALS DESIGN іѕ аlwауѕ tо рrоvіdе уоu thе mоѕt рrоfеѕѕіоnаlѕеrvісе. Whеthеr іt'ѕ a Gаrаgе dооr Inѕtаllаtіоn, Gаtеѕ & Fеnсеѕ Inѕtаllаtіоn оr Rаіlіng Inѕtаllаtіоn, wе аrе rеаdу tо dеlіvеr dереndаblе and аffоrdаblе ѕеrvісе. Wе аrе a fаmіlу оwnеd METAL COMPANY fіrm, аnd wе аrе аvаіlаblе 24/7. Wе wоuld wеlсоmе the орроrtunіtу tо earn уоur buѕіnеѕѕ. Yоur ԛuеѕtіоnѕ аrе аlwауѕ wеlсоmе. Wе dоn’t juѕt want tо bе a оnе-tіmе ѕеrvісе соmраnу; wе wаnt tо bе уоur Company fоr lіfе. Plеаѕе саll аnуtіmе; wе аrе hеrе fоr уоu. With over 40 years of experience we pride ourselves on providing a quality product at a reasonable price while adhering to an on-time schedule. We are very knowledgeable in all phases of stair and rail building and our experience allows us to aid in design issues of stair configuration, as well as to help in railing designs. We have found this to be very helpful to our clients and ourselves. An architectural and structural steel fabrication company, we only create work of the very highest quality. We are happy to assist with design ideas to help you achieve a product that you will love.